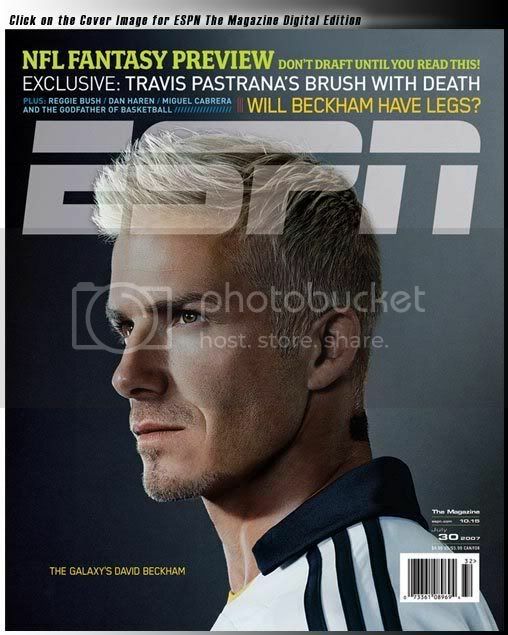 ESPN the Magazine will be the latest magazine to have David Beckham grace it's cover. In other Beckham news off the pitch, fans in LA can't buy Beckham's adidas boots made with kangaroo leather right now. Thankfully, there are no animal rights activists going after adidas' Beckham jerseys. Now that Beckham made his cameo appearance versus Chelsea, which was the highest rated MLS game in ESPN history, the question remains as to when Beckham will make his debut in a match that counts for LA. Apparently it doesn't look good for Beckham to be in the Galaxy lineup in their upcoming Superliga matches versus Pachuca and Chivas. And you know that everyone selling tickets for the August 5th match in Toronto are hoping that he waits and heals up, so that they can get a maximal return on their investment. I contacted the Minnesota Thunder yesterday about getting Tony Sanneh on Saturday's edition of Kick This! And while Sanneh has yet to officially sign with the Thunder, they did indicate that he will not be playing in the match on Saturday if the deal does become official later this week. Forward Natasha Kai, midfielder Angela Hucles, and defender Marian Dalmy were given the final three roster spots on the US squad heading to China for the 2007 Women's World Cup in September. Hucles will be making her World Cup finals debut after being named to the 2003 team, but missing the tournament due to injury. Kai becomes the first Hawaiian named to the Women's World Cup team. Brian Ching became the first Hawaiian named to the Men's World Cup team last year. And Dalmy has the fewest caps of any US player named to the roster. Dalmy has only 2 caps in her USWNT career. Both caps came in 2007 in matches versus Mexico and Canada. The US opens the tournament on September 11th versus North Korea. They will then face Sweden on the 14th before completing group play versus Nigeria on the 18th. The US fell 5-2 yesterday in their Pan Am games opener versus Argentina. John Ball was in the starting lineup for the US, but was unable to get onto the scoresheet. The US faces Ecuador this afternoon and completes group play tomorrow versus Costa Rica. Costa Rica defeated Ecuador 6-4 in the other opening day match in Group B. - Soccer by Ives says that Freddy Adu to Benfica is imminent. That seems like a pretty good fit for what Adu needs at this point in his career. But only time will tell. - Big Apple Soccer.com and Soccer by Ives are both reporting that Red Bull is trying to buy AEG out of their portion of Red Bull Park. Given the success of AEG and the relative lack of success of Red Bull with regards to running MLS clubs, I wonder if this is a good thing for the future? - In player news, the Chicago Fire are close to signing Costa Rican forward Paulo Wanchope. Wanchope has a history with new Fire head coach Juan Carlos Osorio during their time in the EPL. Chicago is obviously hoping that Wanchope and Blanco can form some explosive chemistry for the Fire. FC Dallas have added 19-yo Brazilian striker Ricardinho. It will be interesting to see how much of an impact the youngster can have on a team that is 2nd in the west, but could use a boost offensively. - SI.com's Greg Lalas ponders whether this is the highest quality soccer that MLS has ever put forth. I think the level of play has been elevated this season. That makes me wonder why people are so worried about expansion diluting the player talent in the league. - The San Jose Earthquakes v2.0 have an MLS run webpage up and apparently Oakland A's GM Billy Beane is taking an interest in soccer. I'd be really interested in seeing how much Beane's "Moneyball" ideas can project to MLS given the worldwide nature of the sport. - The early returns on Kyle Beckerman in a Real Salt Lake jersey seem favorable. I'm still trying to figure out what the Rapids were thinking.